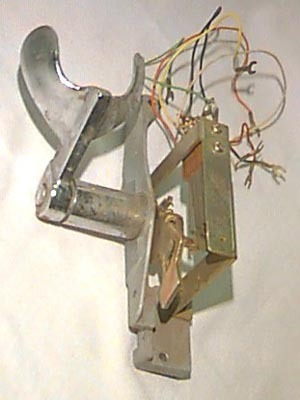 Hobby Telephone Switch. This is great for making up old fashioned wood or steel telephones, or using in a box of any type to hang your handset on and shut off and on the telephone. As it is seen here, it could be screwed to a vertical surface and used as a telephone. All you need is a handset and if needed, a dial network and perhaps a dial to dial out. This switch is of the highest quality made in the 1916s when 20-year life spans on telephones were in. Hook is of high quality chrome plated zink. I have a quantity of these.